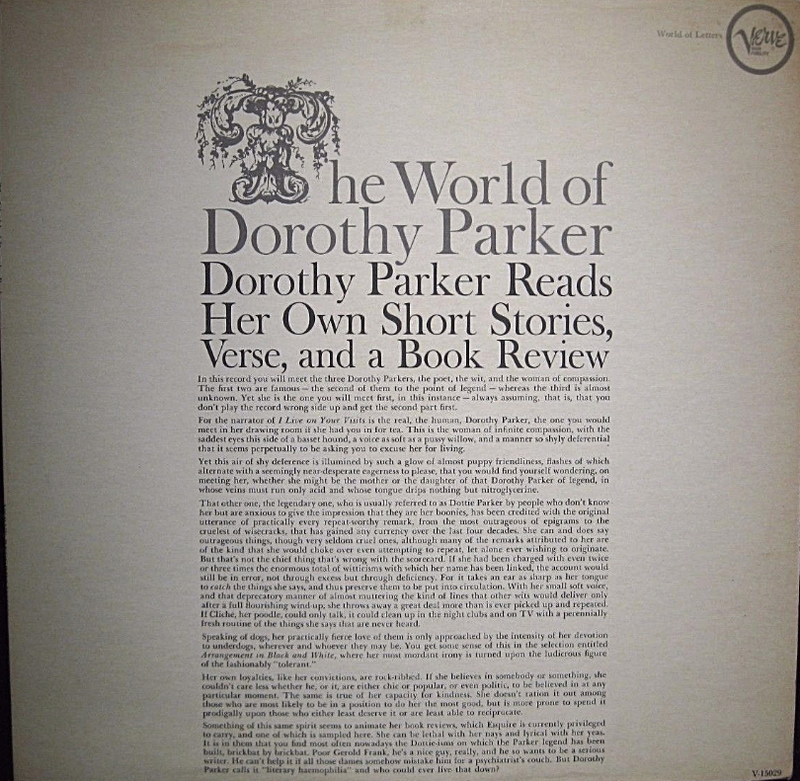 1956: Her first LP is from Spoken Arts, An Informal Hour with Dorothy Parker (Spoken Arts 726). 1964: Verve asked her to read her poems and stories for The World of Dorothy Parker (Verve V-15029). An Informal Hour with Dorothy Parker is short stories, a few poems, and a book review. The World of Dorothy Parker is more expansive and covers her light verse and the bulk of her most famous pieces. Just to share how this transpired, this is now the third iteration of these files. Originally when they were digitally transferred (by me) from vinyl, to cassette, to digital, they were created as RealAudio files (remember those)? After that system went kaput a few years later, all the links died. I then transferred them to MP3 files, and used a tool to embed them in the HTML pages. But that app died too. So three years ago I spent A LOT of time transferring them (one by one) to Soundcloud. And Soundcloud, which I hope never goes out of business, is the best. Now the clips can be shared in every way imaginable, across social media, and shared. This exposes the clips to a wider audience. And gets Dorothy Parker into more homes, and even listen on your phone. That’s incredible. The pages of audio files are here.